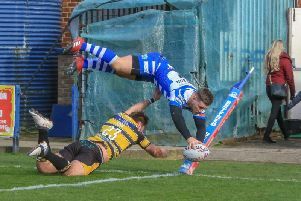 Halifax have confirmed the retention of three more players for 2016, with forwards Ross Divorty and Andy Bracek and young full back Joe Martin all signing new one year contracts. Wales duo Divorty and Bracek were mainstays of the side that finished fourth in the Championship and then sixth in the Super 8s Qualifiers during coach Richard Marshall’s first season in charge at the Shay. Martin, who began the year on loan at Gloucester in League 1, has been dogged by injury but recovered in time to play a part in the Super 8s. So far, only forward Jack Spencer has left the Shay with more contract announcements anticipated ahead of the start of pre-season training next week.